Condo Confusion . . .
‘Condo’ , short for Condominium, is one of the most misunderstood and misused terms in Real Estate. Often utilized to describe a ‘style’ of property; it actually is a ‘legal’ term depicting ownership. If you’ve purchased a typical house, you own the inside, the outside, the land it’s built on, the airspace above, and in some cases, the mineral rights below; and normally are responsible for all maintenance and repairs. Your house may be a part of a ‘HOA’ or Home Owners Association that performs some of these functions for a monthly or annual fee, but they are simply a service provider. In the case of a Condo, you normally own the interior of the dwelling, but have a ‘shared’ ownership of the building, the land, the amenities and common areas. The common terminology used for this is ‘Walls In’. Maintenance, repairs, improvements, insurance, and other items affecting the inside of your unit are your responsibility; while those items affecting the property as a whole are typically done through a ‘Condo Board’ made up of individual owners. Most Condos charge owners a periodic fee, pro-rated by size, to cover their expenses. While we normally think of Condos in terms of High Rise or Mid Rise buildings, there are also Townhomes, Lofts, and even Single Family Homes that could be Condominiums. 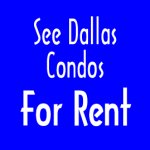 Intown offers a wide variety of Condos, For Sale and For Rent, in virtually every neighborhood of Dallas; and across a wide spectrum of style, size, and price. If you are looking for the ‘Carefree’ lifestyle demanded by ‘Busy Professionals’ and on-the-go ‘Empty Nesters’; then Condo living might be an excellent choice. 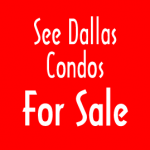 Check out the Listings below to preview some of Dallas’ most desirable Condos; and then call an Intown Associate to see first hand.